There’s nothing about IN THE DARK that makes it a better or more original film than any number of other EXORCIST rip-offs. It is, however, professionally made and delivers the goods its audience expects, so if you really want to see this material get rehashed once again, you could do worse. In the Linda Blair role is Grace Folsom as Bethany Mills, a college age artist who recently survived an accident and is currently living at home with her mom Joan (Catherine Cobb Ryan). Bethany has just started a new series of paintings with a distinctly creepy vibe when strange things start happening in the house – lights flicker, radios go off and on, and mysterious and dangerous apparitions start to appear. Meanwhile college student Veronica Carpenter (Lynn Justinger) is working on her thesis about the paranormal. She’s a skeptic, and is more than a little rude about letting her latest interview subject, parapsychologist Lois Kearne (Fiona Horrigan), know it. Kearne freely admits that most of the cases she investigated were either hoaxes or perfectly explainable phenomena, but there were a handful that she considers proof of the supernatural. One in particular involved the exorcism of a young boy, and it is because of that case that Joan Mills comes to Kearne looking for help. Kearne agrees, bring Veronica along, too, and before you know it the demonic shenanigans are in full effect. While I wouldn’t say anyone in the cast is outright bad, most of them have their performances dialed up to 11. Justinger in particular comes across as way too over the top, constantly exuding attitude and snark that, regardless of her personal beliefs, wouldn’t make much sense if she were really a student interviewing someone of Kearne’s status who had graciously given of her time. Despite the fact that Kearne would seem to be a more secular exorcist than the priests usually cast in such roles, IN THE DARK still has very much a distinct “faith based” aura to it. There’s lots of heavy-handed metaphysical talk even when the characters aren’t doing battle with demons. 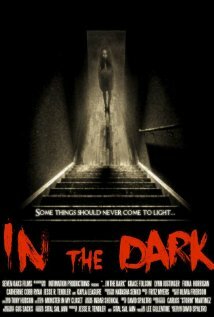 Writer/director David Spaltro’s previous film THINGS I DON’T UNDERSTAND dealt with weighty metaphysical issues as well, but IN THE DARK is a much more focused and coherent film. The small cast and limited locations give away the film’s low budget, but the production values are solid and Spaltro’s style is visually interesting enough to give the film more of a sheen than one might expect. The biggest problem with the film is the “been there, done that” feel that no amount of style can cover up. We’ve seen this same story done countless times before, both better and worse. IN THE DARK is neither good enough to function as a serious examination of faith it wants to be, nor does it deliver on the pea soup spitting, head-twisting, and blasphemous tirades that would make it entertaining schlock. 2 out of 4 stars.